Work has the tendency to be a pain. Fast approaching deadlines, tough clients, and difficult co-workers are known to be a prevailing cause. However, if you aren’t watching the way you sit at your desk – the pain you experience at work can be more of a physical nature. Right now, lower back pain will affect over 80 percent of working Canadians at some point in their working life. If you find that waking up on the right side of the bed and putting a good day of work is becoming impossible because of your lower back pain, then we urge you to take the following advice into account. HOW SHOULD I BE SITTING AT MY DESK? There are many little things we do each day that negatively affect our posture. Most of them occur while we are on our computers, which is what offers workers spend 95% of their work day in front of. It’s easier to keep a good posture if you are setup to do so. By following the right procedures at your desk, your lower back pain, as well as your overall health can become vastly improved. Additionally, proper office ergonomics can increase productivity by an average of 11%! Slouching is the enemy of lower back pain. It’s important to keep your back at a 90-degree angle at all time. Adjusting the back of your chair to about 10 degrees further back should help maintain that posture. reclined angle. It’s important that both your upper and lower back be supported at all times. This step will likely require the most focus. Try to keep your head and neck right above your shoulders. Keep your head straight and keep whatever you are focused on (document, screen, etc.) in a centered position. In an effort to ensuring you’re not constantly slouching, you can start by pulling any essential equipment closer to your body. By bringing your mouse and keyboard in closer, your are limiting the number of times where you are overreaching throughout the day. If you have a proper office chair, there are likely levels under your arm rests or the seat itself. It’s important to understand how to manipulate these levels in order to optimize your comfort. First, push your hips back as far as they can go in the chair. You should adjust your chair so that your upper arms are in line with your torso. In addition, the forearm should become perpendicular to the upper arm as well as in line with the table. Your hands should also be in line with the forearm. You should also adjust the height of the chair so that knees are horizontal to the floor or they are slightly lower with respect to hips. Your office chair is something you are going to be sitting in for roughly 40 hours a week. Because you are sitting in it for a good majority of your life, an upgrade is something that can be well worth investing in. In fact, there are many ergonomic office chairs that will greatly reduce the discomfort you are feeling. One of the best ways to avoid learning in order to squint down at your laptop is to invest in a larger monitor. With a bigger monitor, you will have a better time seeing, and you won’t be tilting your head down to work on your laptop. Additionally, when your screen is kept at eye level, they will become less tired throughout the course of the day. Investing in multiple monitors can even increase your work performance by as much as 30 percent. Perhaps this is a good point to bring up to your boss at the next staff meeting. Download a complete guide of sitting occupation stretches approved by a renowned licensed chiropractor! 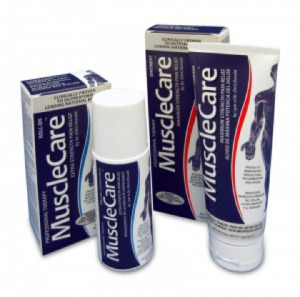 One way many office employees are relieving their left and right lower back pain is by applying MuscleCare and its topical pain relief formula directly on the site of the pain in their lower back. By proper stretching, taking breaks, using MuscleCare's advanced formula when needed, in addition to following some of the pointers outlined in this article, you will find the daily grind at work to be much less painful. * Drugs may reduce the pain and can be used in cooperation with chiropractic care however, drug therapy alone will not provide the patient with an understanding of cause and the complex biomechanical issues that often exist. We strongly recommend an assessment and an explanation from a licensed chiropractor to help patients better understand their own genetic blueprint or injury. Newer PostTired Of Working Out When Sore? Older PostWhat Is The Pinched Nerve Pain In The Back Of My Neck?